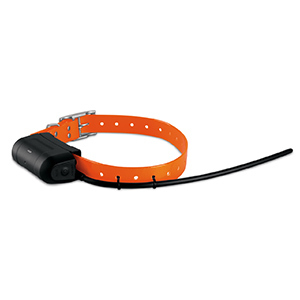 This rugged, all-weather collar combines a high-sensitivity GPS receiver and VHF antenna into an all-in-one transmitter that works with the Astro® 320 and Astro® 220 to safeguard against your dog getting lost. 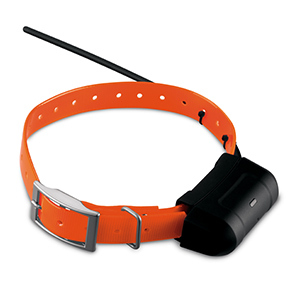 Astro DC 40 sports a durable 1" orange polyurethane collar that fits most e-collar receivers — eliminating the need to put two separate collars on a dog. Plus, Collar Lock uses a 4-digit PIN number that helps prevent others from seeing your dog’s whereabouts. When teamed up with the Astro 320 and 220, this system will have you hunting in no time. The DC 40, in combination with the Astro 320 and 220 pinpoints your dog’s position every 5 seconds. An innovative charging connection with a flashing LED-charging indicator lets you know when the battery is ready to go. You can extend the battery life of the DC 40 by changing the position transmit rate from 5 to 10, 30, or 120 seconds, enabling the DC 40 to work from 17-48 hours in the field on one charge. You will know if your dog is pointing, sitting, moving or treeing. Where your dog is. Where it’s been. How fast it’s moving and how far it’s gone.